Some time branch faces difficulties in retiring import document against L/Cs opened under arranged post import finance facilities, due to lack of proper documentation formalities. 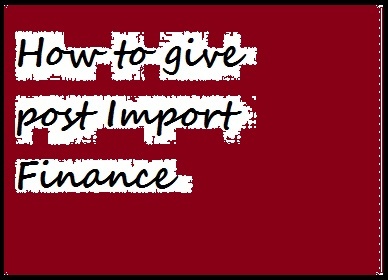 In order to avoid any such distress situation, while processing credit proposals for opening of L/C, branches should as a package deal, also finalize to arrangement for retiring the import documents & if post finance is required, they must complete / finalize all formalities of documentation including security arrangement, before opening of L/C. i. There is a sanctioned amount from Head Office for the party to release of documents under Trust Receipt investment and the outstanding is within the sanctioned amount. ii. The liability in Mura Bill of Exchange (PAD) is adjusted simultaneously creating BAIM (TR). Stamped Trust Receipt in the Bank’s standard form has been obtained for each bill including other charge documents. The due dates of the Trust Receipt are properly diaries and the payments of the bills are followed regularly. Cr. Duty, Tax, Vat etc charges etc. There is a sanction from Head Office for creating Murabaha Post Import (MPI) & the outstanding are within the sanctioned amount. All terms and conditions as embodied in the Head Office sanction advice are compiled with including margin / security to cover custom duty, vat, tax etc. The liability in MBE is adjusted simultaneously creating Murabaha Post Import (MPI). The goods are cleared through the Bank’s approved C & F agents. All formalities for clearance of goods by the Bank’s approved C & F Agents are meticulously followed. After clearance, C & F Agent is to submit – R.R / T.R Bill of clearing agent, Bill of entry exchange control copy to the bank. Goods are properly stored in Bank’s controlled Godown with due record in Stock Register. In all cases Transit Insurance covering the risks is obtained. Goods are delivered proportionately along with the damaged goods, if any in order to protect the Bank’s interest. In case of forced MPI Head Office instructions are followed strictly. The sticky MPI is timely brought to the notice of Head Office and Head Office instructions are compiled with. The Manager makes random physical inspection of goods kept in the godown. Insurance cover for Godown and its goods are obtained and kept valid. Adjustment of MPI liability in terms of credit norms is observed in all cases. In case goods cleared through our outside branch & L/C opening branch is debited by the port / custom / vat / other charges through Bank general A/C then profit for the interim period of transit period of advice should be recovered. Godown should be ‘pucca’ built of brick / cement & be free from dampness, white ants, etc. Godown should not be in inaccessible area & should be connected by motor able roads. There should be no loose electric fittings inside the godown & there should be no windows. Godown is to be under full control of the bank & original / duplicate key must be in bank, with entry in Key Register Lock must be under seal / gala with bank / branch seal. The lock should be charged on half yearly basis. Bank’s display board must be affixed both inside & outside of the godown. If the godown is rented one letter of disclaimer from the owner of the godown & if the godown is his (client) own letter of declaration from the client be obtained stating that they would have no lien over the goods. Godown has direct access and where there is no direct access, the branch holds suitable letter of access from the landlord / client. In case of rented Godown, the rent for the Godown is regularly paid, verified and the latest rent receipt is obtained. Godown Guard’s duty should be charged / rotated by specific office order. No Godown Guard should be posted to same godown for more than six month. Appointment letter of the godown keeper / guard must be taken from the competent authority. At the time of first lodgment of stock, Manager / Investment Officer including the godown keeper & guard of the branch must be present. Manager / Investment officer has to make surprise visit to ascertain the presence of the Godown guard during holiday. No perishable / volatile item should be kept in the godown. For drug / Medicine stock, date of expiry should be written in the stock card to facilitate the delivery of goods before expiry. For chemicals / dyes / raw materials of medicine / spices / frozen item / hide & skin etc. stock should be for short period, failing which quality of goods stored, may be deteriorated & bank interest may be hampered. For limit below Tk. 20.00 lac, the branch manager visits the godown quarterly & by the other officer’s on monthly basis. For limit from Tk. 20.00 lac to 50.00 lac, the branch manger visits the godown on monthly basis. For limit above Tk. 50.00 lac, Head Office team visits the same on half yearly basis. In the stock card Branch official must put his signature, as the witness of store of goods. Goods must be stacked properly (party wise / item wise) to facilitate assessment / counting. Godown stock cards are properly maintained for storage and delivery and the balance tallies with the commodities / merchandise as shown in the Stock Register. The stock cards must show the checking date of the goods with signature of the checking officials. Stock register should be prepared item wise. The posting of pledgement / delivery of goods should be recorded along with value of stock. Monthly stock report should be obtained duly signed by the client. Deliveries of goods to be made as per terms & conditions of sanction advice / prevailing set rules. The delivery orders are properly filed duly signed / acknowledged by the client. The Manager & Investment Officer takes proper precautions for delivery of goods including delivery order jointly signed. There is satisfactory delivery of goods and the same is reflected in the account of the party with the bank. Investment ledger & stock register should be balanced periodically to ascertain security position against concern liability. Market value of pledge goods should be ascertained frequently in order to retain proper margin & drawing power during withdrawals. Market rate register is properly maintained and the Manager keeps constant touch with the trend in prices of all commodities in which the bank is interested. Insurance policy of godowns to be strictly followed as per sanction advice stipulation. Diary / Register for insurance polices is maintained and the insurance renewed on maturity date without fail. Insurance policy must cover the risk of fire, RSD & burglary. It should also contain bank mortgage clause.